Once upon a time, in a land not so far away, the advisors to the empire crowned a prince and proclaimed that he would soon be king. These advisors were known throughout the realm and therefore trusted. 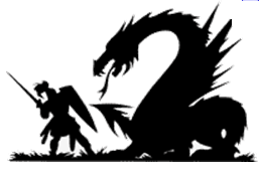 They regaled the adoring masses with the conquests of this pure prince – dragons slayed, damsels rescued, and crises averted. While the public was cynical at first, the stories about the pure prince were very convincing. The accolades from one advisor were soon amplified by another and then another until there were almost no dissenters. Who could possibly want to be the only advisor that was not a supporter of the future king? As time passed, the other princes in the land grew suspicious. A very few observers noticed that the pure prince was being credited for dragons slayed and damsels rescued that never happened. But the prince did not deny what the adoring advisors were saying about his conquests, because he understood that the true battle was a matter of perception. It was about the myths that preceded the prince into combat. And because many believed it so, their gold and their support was rapidly flowing toward the pure prince, leaving some princes without the resources they needed to compete. Eventually the pure prince made his play for the throne. His accountants and prophets detailed his conquests and ledgers. And while the wins in battle were impressive, they were far fewer than all had been led to believe. And the amount of gold spent to win those battles was breathtaking. A king running the empire or a company doing business with this strategy would surely go bankrupt. And thus the pure prince’s own accountants exposed, in a way that discredited the adoring advisors, how he was not what the advisors had made him out to be. With the eyes of the once adoring advisors now opened and the pure prince needing to curtail his spending, the competing princes rallied. The perception of pure success had been exposed as illusion. The pure prince was nothing more, and maybe something less, than any other prince. The competing princes were suddenly more visible on the battlefield of the marketplace where gold in hand, constant struggle, endless innovation, a capricious bit of Luck, but not the obscuring mist of hype would ultimately crown the victor. I just got back from my nth Flash Memory Summit. Special thanks to Tom Coughlin and the crew for putting on a good show and providing an excuse to get together with my friends in the industry. 1. There is nothing quite like a multi-billion dollar industry threatened by extinction to generate new breakthroughs, and 3D NAND technology looks like just the technology to extend the life of NAND flash for many more years. This means we can continue to project out density and cost improvements with NAND flash even as 3D NAND makes dealing with wear levelling a little bit easier for a generation or two. 2. We have been saying for years that “in five years” we would have a technology that could displace NAND flash. It looks like we will continue to be wrong, but the new announcement from Micron about 3D XPoint is nonetheless exciting because it may be our first viable storage class memory. There are a host of things people would like to do with NAND flash but they can’t because NAND is too slow to act as memory, or that they would like to do with RAM but RAM is volatile and low density. 3D XPoint appears to be a product that will enable some clever engineers to reach some markets poorly served by NAND flash. 3. Coincidental to the show, Pure Storage filed for a public offering. The financials that accompanies their filing made me pause and reflect that building a company to launch today is very different from building a company capable of long-term survival. At Texas Memory Systems (TMS), we did business the old fashioned way – we were profitable. The CEO never took on venture capital or long-term debt. His business could have continued indefinitely. The obvious downside of our approach at TMS was that we could not buy market attention and market share. To be relevant in our marketplace we had to produce the best technology. To be interesting to IBM, TMS had to have the best engineering. Now, it seems that the other start-ups in the industry that attempt to develop sustainable business models are mocked rather than celebrated. I think a few more market disappointments and with any luck we will learn to value businesses that build for a future. I believe the companies that are built to survive are better acquisition candidates. 4. The all-flash array market continues to be vibrant and fast growing. Even dropping $100 million from the 2014 market size estimates still shows a market in the early stages of spectacular growth. Just as interesting, we are starting to see companies aim for the edges of the market and position for promising new niches. The long awaited takeover of the data center by flash is well underway. My final word of wisdom from this journey is that you should never take a cab from SFO to Santa Clara. This isn’t Batman; this is your data center! Riddle #1: What is a flash array that is fast like a Ferrari, has reliability and service like a Lexus, but is priced like a Chevrolet? Riddle #2: What do you call the fastest, most feature rich but least expensive offering in a market? 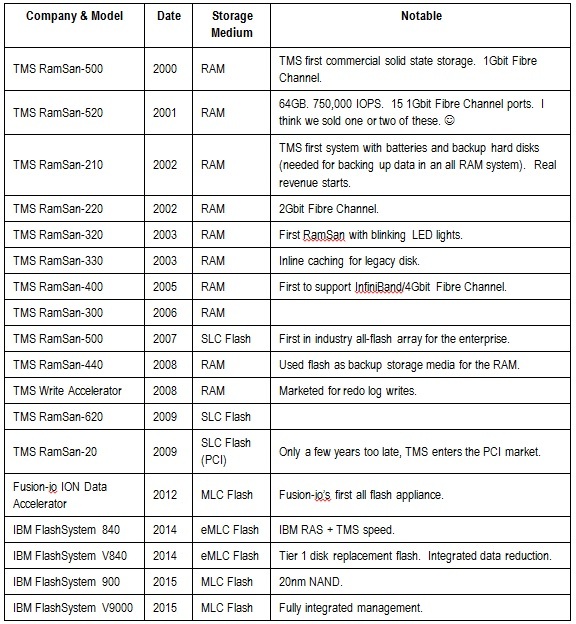 For as long as I have been associated with the solid state storage market, the products formerly known as Texas Memory Systems’ RamSan were labelled as the Ferrari of the market, but mostly in this context: “Who wouldn’t want to go that fast, but who can afford it?” For the most part, we embraced the label because we were the fastest. A quick look at Storage Performance Council results over the last decade can easily substantiate that position. But we did have a problem: The market didn’t perceive RamSan as the affordable choice, so we were left out of competitions before even being given a chance to compete. Who starts out their car buying process by verifying that the Ferrari is cost competitive? It was understood we were that fast and that expensive. Since then, an interesting change has happened. IBM, with its buying power and economies of scale, has taken the Ferrari engine, surrounded it with Lexus-like reliability characteristics, and is now delivering it to the market with the lowest all-flash array price per capacity, according to some simple extrapolations from the latest IDC report on the state of the flash market. Why is IBM throwing away its margins to take ownership of this market? It’s not. The economics are actually simple. IBM engineers the entirety of FlashSystem. As any accountant can tell you, this means that our R&D and engineering costs are going to be higher than the industry. But this is, in accounting terms, a fixed cost. If we pay this cost and don’t sell many products, we run at a loss. But if we pay this cost and sell a lot, our cost per unit only drops. IBM buys NAND flash chips for FlashSystem; we don’t buy SSDs. Why does this matter? SSDs, in spite of their commodity nature and poor performance, are margin rich products for the companies that sell them. When our competitors buy SSDs to put in their all-flash arrays they are paying to someone else the margin needed to make investors happy while covering engineering investments. Thus, using SSDs actually makes the flash array product you buy more expensive. In accounting terms, SSDs represent a variable cost. As a vendor, you pay that same variable cost on every product you sell. Any business person will tell you it pays to decrease your variable costs because this enables you to bring your product to market for less cost than your competitors. This is especially important when you’re selling at the kinds of volumes where IBM sells in the all-flash array market – more than the next two competitors combined in the first half of this year, according to the same IDC report noted above. This explains why we are indeed a leader in this market space. Maybe not what you’d expect from a company with an enterprise-grade reputation like IBM. So, what does this mean to our clients and potential clients? FlashSystem can save you money. But the advantages don’t stop there. Did you know FlashSystem offers inline compression and what’s more, testing of our inline compression at customer sites shows that it can be more effective and faster than that of our competitors? As a potential customer, there is a simple way for you to find out if this is true for your workload – include FlashSystem in your next storage procurement evaluation. You could pay more and get less, but why should you? That’s a riddle worth answering.